Steaming is an honored way to cook fish in Bengal; spice coated, packed, sealed and cooked while you hold your breath, waiting for that first whiff of the exhilarating aroma. Bhapa is Steamed and in most steamed fish curries there is mustard and also mustard oil. Then there are other frills like poppy seeds paste and coconut that adds texture to the sauce. Memories are finely weaved with a strong sense of smell. When I started observing deep inside myself, it confused me when I found out I had a whiff of my maa’s wet hair as if she just walked out of shower, just when I was lost in thoughts, may be back home… a light, fading trail of thoughts which I could not trace back. But the smell was distinct as if she was right there. Or when I look through her photographs and see a sari she was once wearing, it takes me back to that day and the air smells of her perfume.. twenty years later. May be all memories do, or even a sudden desire. Just the other day T was talking about “CiCi’s” pizza. This is something my girls are “fanatic” about. Long lines in the buffet, salads, pizzas, brownies, the same thing day after day and they still are up and bouncing even at the road signs which says “CiCi’s”. I live in fear and try not to speak of anything that reminds them of CiCi’s. Anyway, while T was talking of CiCi’s pizza, she declared that she can smell the pizza she loves – the Buffalo Chicken pizza; and the more she talks about it the smell is getting stronger, she said. So it is not just me. Memories, urges and desires are entwined with the sense of smell. It probably helps give shape to the perception we have of ourselves, our inner thoughts, our likes and dislikes, in a tangible form that we can hold on to, something we can percieve. When I start planning on making Bhapa Chingri or even see or hear about it, the nose has a sudden tickle. I can see myself breathing in the exhilarating aroma of the green chilies getting rubbed down with the shorshe (mustard) and the posto (poppy seeds) in the shil nora. If you are going to use mustard powder, which you ground before hand and stored, the sauce might get slightly bitter. This is caused by the dark husk of the seeds. There is a way around by soaking them in a tiny bit of vinegar, water and turmeric (I have mentioned in the recipe below), which might reduce the bitterness. Using husk free yellow mustard helps, but those are not too easily available in the local stores. Here is what I do; dry grind the mustard in spice grinder, and then pour them out in tray/plate. Gently move/shake it side to side and the husk comes up and accumulates on the top. Now either remove the thin layer of husk with a spoon from the top or collect the mustard powder with less husk from the sides and around. Keep repeating a few time until you have been able to separate most of the husk. It is a painstaking process and you will NOT be able to have a completely husk free powder. But see for yourself in the photograph below to what may be achieved. The mustard oil and the turmeric add a bright yellow hue to the paste and makes it even more fragrant. 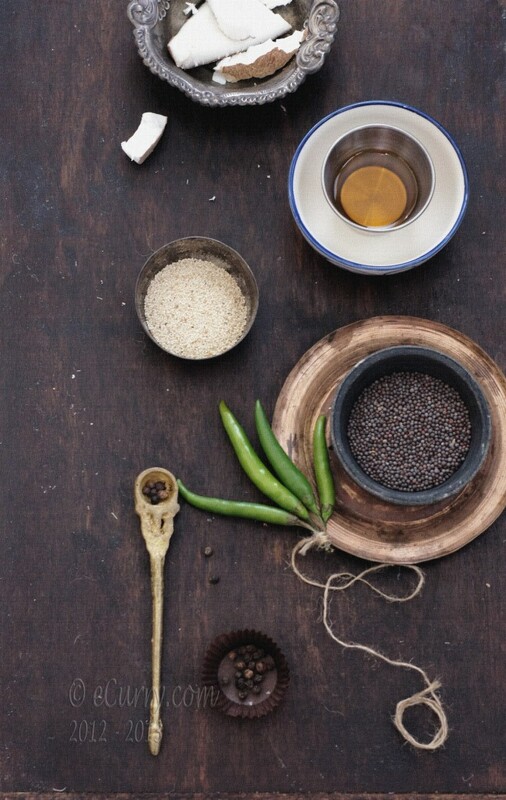 While some homes do not use coconut or poppy seeds, others use both or only one of them with the mustard. I tend to use a bit more coconut than the traditional recipes call for. I have learned the trick of using yogurt from Bong Mom’s recipe. The yogurt helps when a little extra sauce is desired. I have used cream of coconut in absence of yogurt and that works fine too. 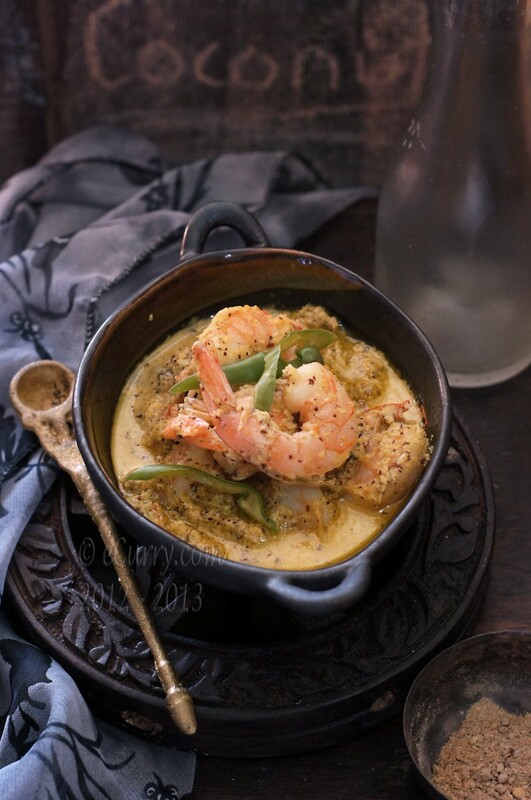 The recipe is a classic with almost no work involved if you already have had the shrimp/prawns cleaned up. **If you are using frozen shrimp, defrost completely before use. Just running them under cold water will quicken the process. Note: If you are using frozen coconut, defrost before using. If you are grating/grinding coconut at home, make sure to use only the white flesh; you will have to peel the brown skin away. Some times the mustard paste turns bitter: the reason is the husk of the seed. The yellow mustard works better as the husk is removed, but it is not easily available. 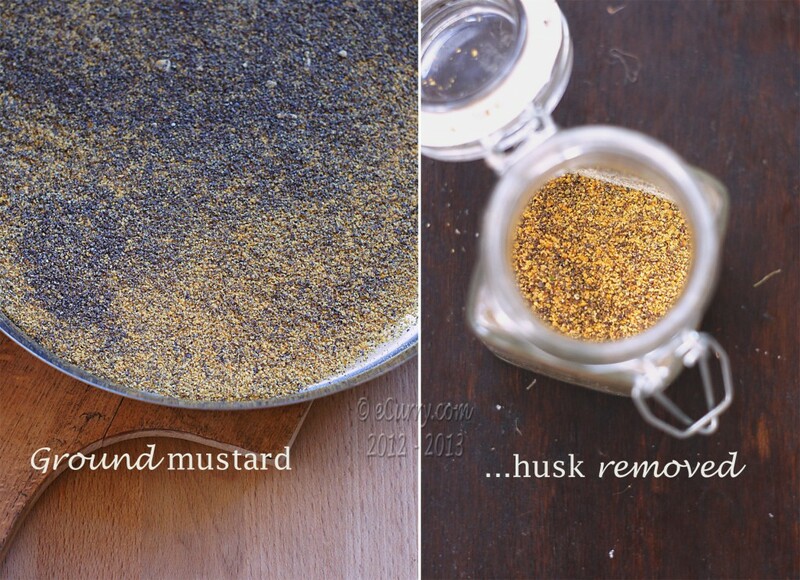 If you are dry grinding the mustard, try to give it a light shake after grinding to separate and remove some of the husk. If you already have dry and powdered mustrad seeds, soak the mustard powder in water and a 1/2 teaspoon of vinegar and little turmeric; when you pour out discard the black deposit/husks at the end of the cup. Overcooking will make the shrimp tough and chewy; you will have to watch and adjust cooking times, which will vary on a lot of different things. Shell, de-vein and wash shrimps. Pat them dry. Sprinkle some salt and 1/2 teaspoon turmeric and allow them to marinate for about 15-20 minutes. Soak the mustard, poppy seeds, and peppercorns in a few tablespoon of warm water (just enough to cover the spices) for about half an hour. Grind the mustard, poppy seeds and peppercorn into a smooth paste with splashes of water. Do not make it runny. Now add the yogurt or cream of coconut, if you are using, half of the hot chili peppers and the coconut (esp. if you are not using grated or the store bought frozen ones) and grind everything together to a paste. Stir in the salt, sugar and turmeric in this paste. Stir in half of the mustard oil. Coat the marinated shrimp with this paste and allow it to sit for 15 more minutes. Now this can be steamed in different ways. You have to have a container (we use the stainless steel container with a tight fitting lid) which can be cooked in and with a tight fitting lid. Place the spice coated shrimp/prawn in the container. Add the rest of the mustard oil and the rest of the hot green chili peppers (slit them) and stir them in. Close tightly with a lid. If the lid is not very tight, cover the container with a foil and fit the lid in. If using a pressure cooker, add water to the cooker pan, place the ring in and lower the container. Cook until it hisses and 2 whistles later, switch off the heat. If the cooker does not have a whistle, but is time, cook for about 3-5 minutes after the pressure builds up. To cook in the microwave, combine everything together as above in a microwave safe bowl. Cover with a lid and cook for 4 minutes. Remove from microwave, stir everything and again cook for 3-4 minutes, or until the shrimps are cooked through, are pink and curled. The cooking time will vary will the power of the microwave. 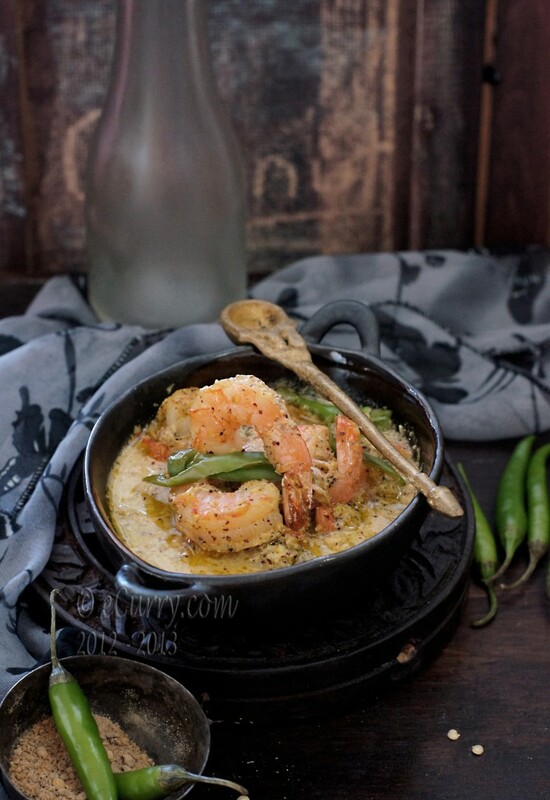 Steamer: This may also be cooked in a steam basket/steamer; place the spice coated shrimp in parchment paper, and wrap with foil in a way that no water drops can go in. Steam for about 15 – 20 minutes, or until the shrimps are cooked through and not transparent anymore. You will have to adjust the cooking time. Bake: Combine everything in an oven safe bowl. Cover and bake at 350 for about 12 minutes. Uncover, stir and bake bake for another 5 minutes. The shrimp should not be transparent and should be cooked and curled. The cooking time might vary, so adjust the time. In a water bath: Place tightly closed container in a water bath, with water coming 1/3 was up to the sides of the container. Cook for about 15 minutes or until the shrimp is cooked and opaque. September 14th, 2012 | Category: Curries, Seafood, Sides & etc. Very nice write up and the recipe too. I always look forward to reading the notes and detailed instruction that you give. I take note of using a dash of vinegar in mustard powder and also use of white or black pepper…will try your method soon. Tasty! This curry looks mouthwatering. Emni torture korle hoy? office e boshe ei recipe porle jibher jol atke rakha jaye? wonderful recipe. I make a similar chingri but I cook instead of “bhapa”. The ingredients are such that very little can go wrong, right?Will post mine soon, took some pictures last week. This is on my to do list and I might use the Dijon mustard that I have if I can’t find yellow mustard. Looks absolutely fantastic. Do you know that posto is banned here – forget posto, just shil norar kathata bhebe khub nostalgic lagche. BTW, I’ve taken a lot of pictures of SHilNora and the way narkol is ‘korao’ed – don’t know why! I can smell the prawns and that reminds me of a previous post that you had done on prwans in a black ‘koda’ and ‘sharashi’! BTW, I’m eying your spoon and the string! They look amazing Soma. We’re having an Indian party next week with friends. Well party is a big word maybe but were cooking with friends and the theme ja gonna be Indian food. I’m still browsing around your site looking for inspiration! Thinking of doing one of your chicken curries and am looking for an appetizer too. Suggestions? 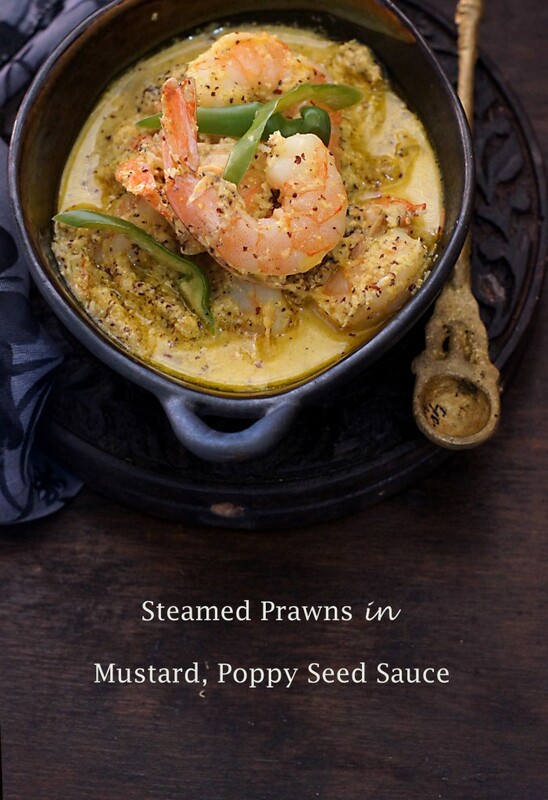 We’re also thinking of doing a prawn dish so maybe this is one to keep in mind…. That dish looks rich and delicious,Soma! Your pictures make me drool :)Amazing! I really, really love they look so darn yummy! What a lovely vision. I’ll just have to cook up my own tonight! I was smiling as I read this post, Soma. I’ve often wondered if others have most of their memories attached to a smell. For me, even a subtle whiff can bring back sharp details from years ago. And a photo can bring back smells that are distinct and strong. Just like the photos of your Shorshe Chingri did right now – Kolkata, dupurer khaoya, Ma, gorom bhaath, golpo. Thanks a lot for sharing this recipe. My prawns are cooking right now and I can already tell you they are going to be super delicious. Love love love it. Looks delicious! Do you know where I can get a shil nora from?